A tomato, some salt and a pickle walk into a bar. . . . . WAIT, don't cringe and click away! These lovely little bites of Bloody Mary inspired tapas are delicious, thanks to both those vodka flavors. Plain vodka is just boring with this recipe. Trust me, I did all three and the plain vodka tomatoes might as well have been totally sober. This whole recipe was actually inspired by a bottle of Naked Jay BIG DILL sent to me as a sample which I really liked. I am a big dill pickle fan though and if you're not don't use the dill pickle vodka. You can use tomato vodka but that seems a little redundant to me. The addition of using my Homemade Bacon Vodka on some of the tomatoes was because I wanted another flavor in some of the tomatoes. I tossed them all together for this presentation. I like the idea that you don't know which flavor you're going to get. Feel free to put the different flavors in different serving dishes if you like, not everyone likes a surprise. You'll want to serve these up with some lovely choices of dipping salts. Here I've used (from the bottom of the photo up) Cypress Black Lava Salt Flakes (in the pile), some marvelously earthy Truffle Salt, some Himalayan Pink Salt and some wonderfully smoky Artisan Salt Company Salish Alder Smoked Salt. Bacon and Pickle Vodka Infused HEIRLOOM TOMATO TAPAS Think of these as edible cocktails! DIRECTIONS: Poke quite a few small holes in all the tomatoes with a toothpick, place the tomatoes in small bowls and cover them with your choice of flavor infused vodka. Do this for all the different flavored vodkas you're working with. 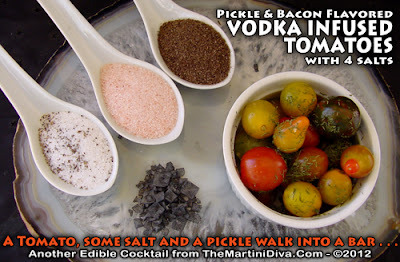 I added fresh dill weed to the pickle vodka tomatoes and some course black pepper to all of the tomatoes. Let these sit overnight or even for a couple of days. The longer the tomatoes sit the longer they will soak up the flavor - up to about 3 days. Pour the tomatoes through a medium metal strainer over a bowl - you want to drain the vodka off but DON'T THROW IT AWAY ... chill that vodka and serve it with the tomatoes in cold shot glasses, it's a lovely drink to have with this dish. Plate everything up and enjoy. Next time I might try adding some fresh, crushed garlic to the plain vodka, it might help pop the flavor up a bit. Another combination that would be nice would be some fresh basil and a couple of teaspoons of balsamic and add some mozzarella balls to the plate.